Your branding, or rather, your branding colours, are what makes your business stand out. 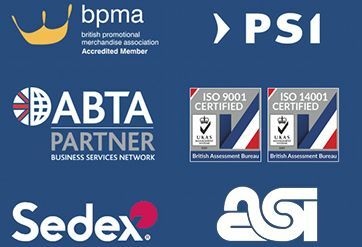 It's like a signature that helps others recognise who you are and what your business does. However, when it comes to promoting your business, you are sometimes limited in terms of colours. Because of that, things can get out of hand and look inconsistent, not to mention distinctly unattractive. 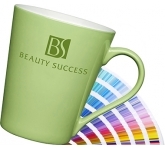 Luckily, that's not the case when you use eye-catching branded Pantone matched mugs! You've worked hard to pick out the right colour scheme for your business, and now, it's your signature colouring that helps people recognise your brand. Therefore, it's only logical to use the same colours for your promotional products. 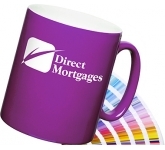 After all, you want your clients to stay loyal to you - so why not remind them of your brand with printed Pantone matched mugs? 2. 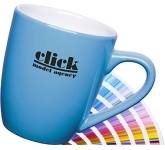 Pantone mugs offer a great return on investment! While promotional merchandise may sometimes require you to make a significant investment, that money is never spent in vain. 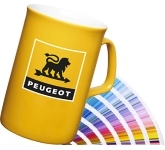 In fact, when it comes to branded mugs, the more you get, the less the unit price for each will be and their return on investment has been proven over many years to be significant! But that's not the only aspect of them that you should pay attention to. 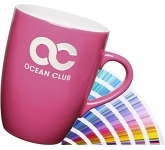 These mugs come in a variety of shapes, so you can always pick the most suitable one for every event! 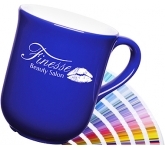 Furthermore, you ought to know that promotional Pantone matched mugs are also great giveaways and that you can use them for pretty much any event. Do you have a trade show coming up? 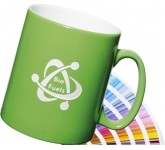 Why not give away mugs to your eager potential clients? How about an exhibition? Don't make the visitors rack their brains so as to remember your brand. Instead, use branded Pantone matched mugs to inspire their memory and help them never forget you! 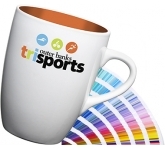 Cost-effective, colourful and impactful - these mugs will surely bring you the ROI you deserve, the clients that you want, and most importantly - an advertising campaign that will generate results for a very long time! 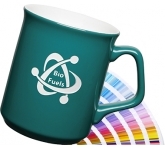 Maybe you've seen that a lot of businesses use mugs as their main promotional products. 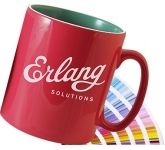 However, just because others are using mugs as well, it doesn't mean that you shouldn't! 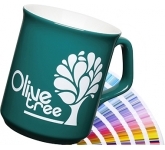 On the contrary - mugs can generate a high level of brand exposure with just one sip - think about it, every time your recipient takes a sip from their favourite mug, they will be seeing your important message - it doesn't get much better than that! 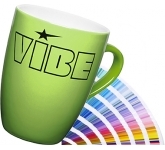 But in order to stay relevant and recognisable, you ought to use promotional Pantone matched mugs. That way, both your current and potential clients will see that your whole company is as streamlined as your marketing and advertising campaigns. What's more, they will love the fact that you've used such a practical item to show them that you care while at the same time promoting your business or organisation. 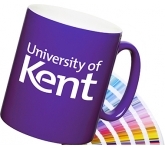 We offer a variety of printing options on our extensive range of Pantone matched promotional mugs, ranging from screen printing right through to the very latest in UltraHD print technology allowing us to reproduce full colour images and logos to a standard most suppliers can only dream of. Our team of professional graphic designers are always on hand to offer expert advice in product selection and to ensure that your logo and message is reproduced to the highest quality, representing your brand in the very best possible way? 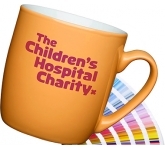 So, if you are looking for low cost, budget, value or cheap promotional Pantone matched mugs, and find the same custom branded mugs cheaper, with the same print specification and turnaround, just let us know and we will match the price and back it with our industry Award Winning Customer Service - that's our guarantee!! 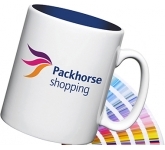 For additional information on our Pantone matched mugs or to find out why businesses choose promotional mugs to succeed with their advertising and marketing efforts, why not contact us and have a chat to one of our dedicated account managers who will be happy to advise you further.